The Estill County Quilt Trail is a project of the Estill Arts Council that became a true community wide effort. Citizens from all walks of life, both women and men and, young and old, came together to help in the selection of quilt patterns and barn sites. Mondays became known as the “quilting bee” night as volunteers showed up to draw and paint, for close to two years, in order to complete and install over 50 quilt squares. Through this project many new friendships were made and a sense of pride in the rich cultural heritage of the community's historic, agricultural, and folk art roots was realized. The trail includes nearly 50 distinct quilt patterns. The Quilt Trail began in 2001 in Adams County, Ohio by Donna Sue Groves to honor her mother, Nina Maxine Groves a lifelong quilter. 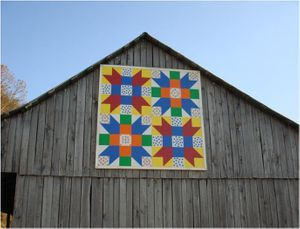 The Quilt Trail soon spread to Kentucky, Tennessee and many other states and became a destination for tourists wanting to travel the rural highways and scenic back roads in search of local cultural heritage. The project celebrates women, Appalachian heritage and honors quilters and the historic agricultural (tobacco) barns. The Estill County Quilt Trail has been sponsored by the Estill Arts Council, Kentucky Arts Council, Kentucky Folklife Program, Cumberland Valley Resource Conservation & Development Council (RC&D), Chamber of Commerce,EAD, (www.estillcountyky.net), Kiwanis Club of Irvine/Ravenna, Citizens Guaranty Bank and many private individuals. Thanks go to the Wisemantown United Methodist Church for the use of the basement to paint the quilt blocks. When viewing the Quilt Trail, use caution when slowing or stopping near a site. Many sites are on private property and should be viewed from the public roads, unless otherwise indicated, or at a business open to the public. We are indebted to our barn hosts for their generosity.